I did not realise that the angel in the picture yesterday was a “weeping angel” (an alien life form capable of time travel). How was I supposed to know—the eyes were not covered? Anyway my brother-in-law Laurence blinked and suddenly he was transported into the future. Luckily Laurence got a message to me by posting it in my blog in the future and backdating it so we can see it (see his message in yesterday’s comments). 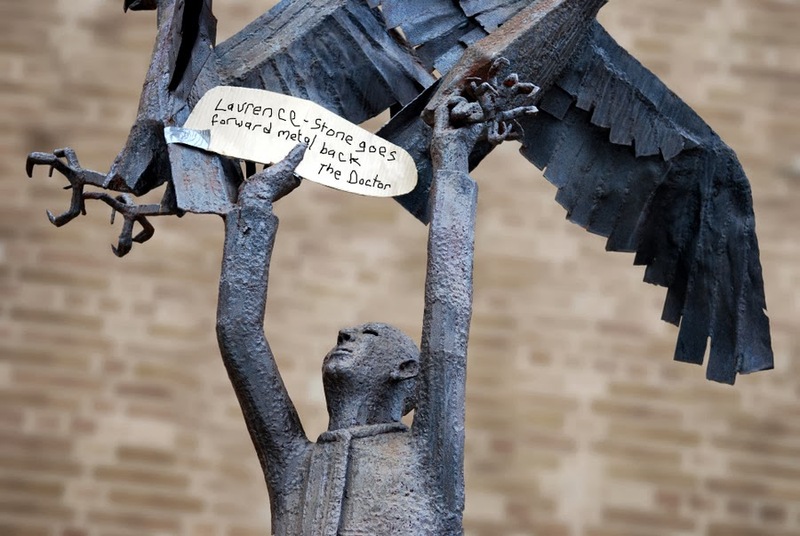 So today’s post is for Laurence: Hey Laurence there is a message in today’s photo from “the doctor.” So all you have to do is find a metal weeping angel and blink – then you will be in the past. Of course you will probably not wind up on today’s date but will overshoot and wind up several years earlier, but all you have to do is hang around enough years until yesterday comes around again then find yourself and shout “don’t blink” at the right moment and that should then fix things.